Sailing families around South Australia are getting set for the Goolwa Regatta Week, and its marquee event the Milang-Goolwa Freshwater Classic, which is well known as one of the most enjoyable and lifestyle-focused on-water events in the State. With a rich regatta history and being held in one of Adelaide’s most popular getaway destinations, Goolwa Regatta Week combines a range of community events with some challenging but enjoyable sailing, emphasising what grass roots regional regattas are all about – bringing people together and supporting local clubs. Goolwa Regatta Yacht Club, in partnership with the Milang Regatta Club, has been running the Milang-Goolwa race officially since 1974, however the history runs a lot deeper than that. This year the event’s major sponsors are Finniss River Vineyard and Coorong Quays Hindmarsh Island, two great local businesses. Originally there were two Goolwa sailors who both believed they had the fastest boat on the river. The late Bill Appleby and the late Bill Ballard, and their yachts Esther and Edith, raced each other from Goolwa to Milang for the first time on 27 December 1966 to determine who was faster. The two yachts were evenly matched and in the first three years the largest winning margin was only three and a half minutes, while the closest was just 12 seconds. Esther won the first two races, Edith the third. From this point, more boats joined the race to establish it as an Australian yachting classic, which was changed to run from Milang to Goolwa and still holds the record for the largest freshwater event in the Southern Hemisphere when 584 boats made it to the start line in 1986. Low water levels brought on by drought conditions in the Murray Darling Basin led to four races being cancelled from 2008-2011, however when water returned in 2012 so did the race, resuming its annual place in the Goolwa Regatta timetable. 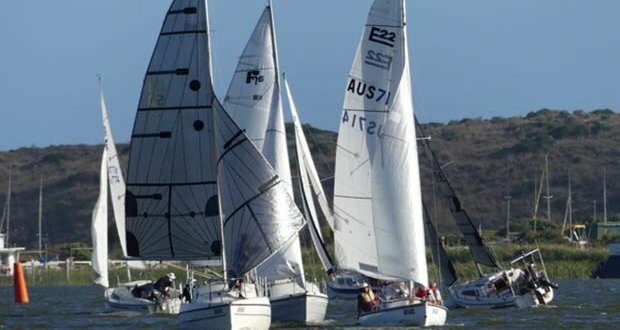 This year’s event kicks off this Saturday with the Coorong Quays Marina Challenge, which showcases some tight and slalom-style racing through the close quarters of the Coorong Quays marina on Hindmarsh Island. The Elders Insurance Aqua Spectacular then takes place on Sunday, which showcases all of Goolwa’s sailing community with junior and senior dinghies, trailer sailers, historic boats, Sailability, a sandcastle competition and even a pool toy race. A week of community fun then takes place over the following week in the lead up to the main event, with radio controlled yacht racing on Monday and the famed Dominant BBQ Cook Off on Wednesday for ultimate bragging rights. A tune-up race is held on Thursday night, followed by the Kies Hardware Dash for Cash on Friday night, which is always an exciting event as boats go head-to-head for a ‘winner-take-all’ prize. Boats are delivered to Milang on Australia Day in a leisurely cruise down the river, followed by a great night in Milang before the main event, the Milang-Goolwa Freshwater Classic, takes place the next day. Don’t miss out on this spectacular event that is fun for the whole family, come for some, part or all of it, and just soak up the experience, it truly is one of a kind. Entries for the main race close at midnight on Monday 21 January for trailable yachts, with off-the-beach entries closing at the same time on Wednesday 23 January.